Some shots of first proof off the press. (All photos below were taken by Emily Hancock of St Brigid Press, as she was doing first proofs.) This is on the bamboo paper. We’re still deciding what the best paper might be. Emily ran some proofs on other stock and we’re going to go over them with our magnifying glasses and every nerve of our fingertips to see which looks and feels the best. The typeface is 18 pt Centaur, so the paper has to take the ink from a decent size letter while holding to the fine points and handling ligatures. 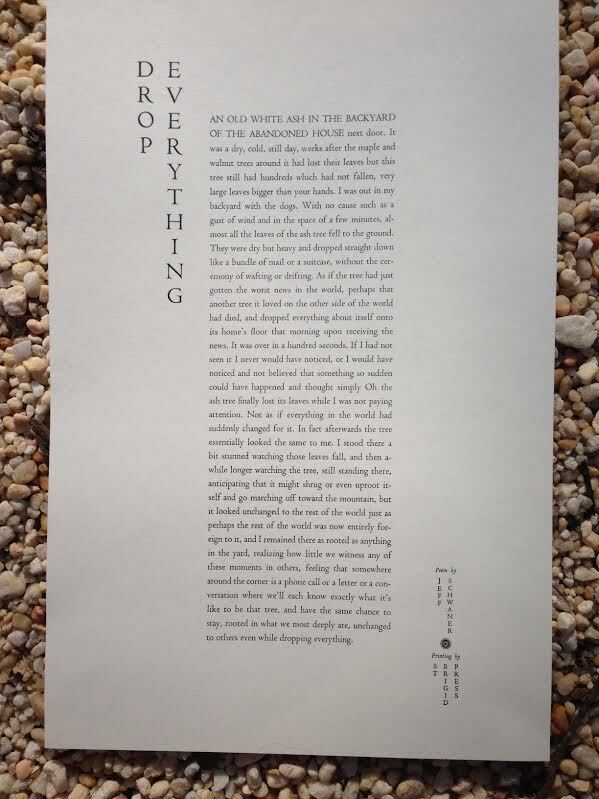 This entry was posted in Book Design, Books, Projects, The Drift and tagged bamboo, bamboo paper, broadside, Centaur, Drop Everything, Emily Hancock, letterpress, literature, poetry, proofs, prose poem, Schwaner, St Brigid Press, The Drift on February 21, 2014 by Jeff Schwaner. The poem is set in Centaur, a crisp and classic typeface suitable for both prose and poetry. It also has strong flavor notes of caramel, charcoal and cherry, with a smooth finish that pairs it well with both fish and fowl…wait, I’m getting carried away here. The poem is part of a larger project entitled The Drift, which somewhat aimlessly uses as its model one of the first anthologies of great classical Chinese poetry, Poems of The Masters, originally compiled in the 13th century and consisting of some of the great poems written in the 7th-13th centuries. This project will pair several hundred short poems, based on regulated verse of the T’ang and Sung dynasties (which I have been posting on this blog since December of last year) with prose poems dealing with the same subject matter in a very different form. There are quite a few wrinkles to this large project’s design, and more on said wrinkles much later, but all this is to say that when designing the broadside for “Drop Everything” Emily and I took into account the influence of classic Chinese poetry on the overall project– and also the method of transmission of those poems back over a thousand years ago. 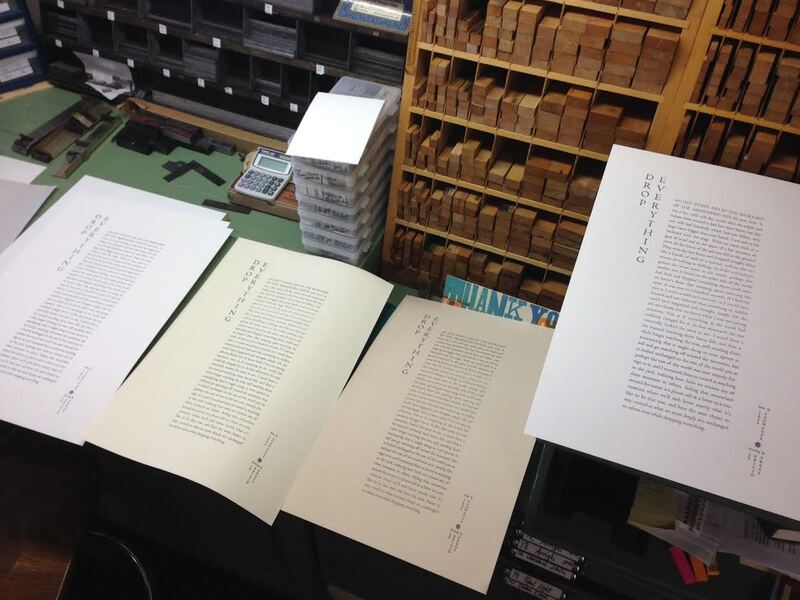 This includes printing the poem on a high quality bamboo paper stock in a strong vertical format (probably around 12 x 18 inches). 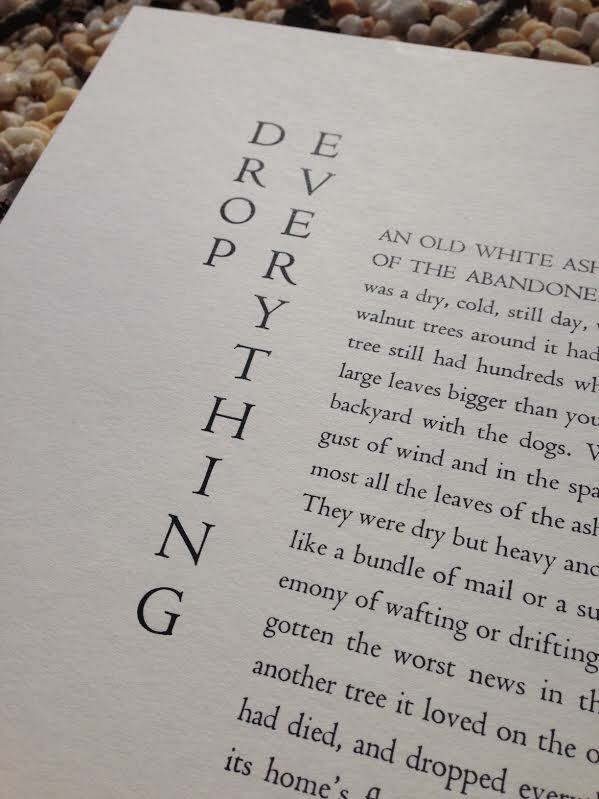 You can find the poem “Drop Everything” on the Brand New Stuff page above. 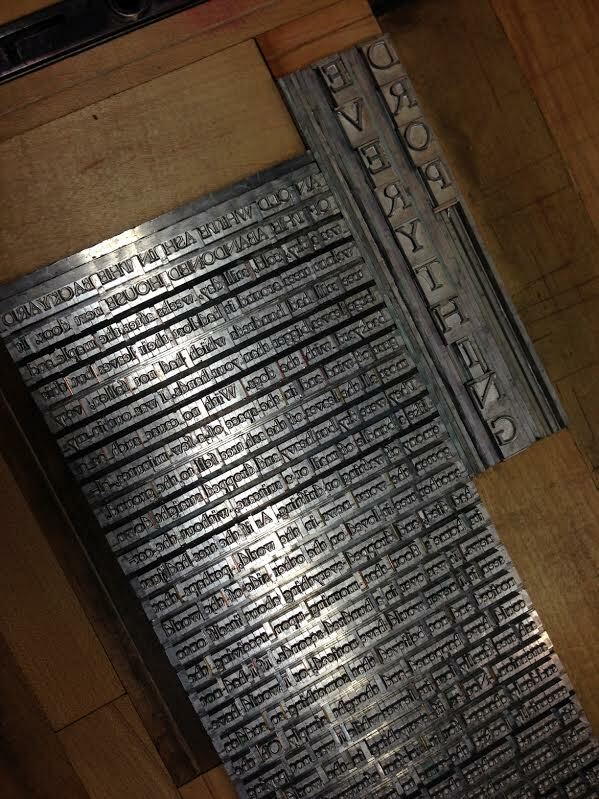 This entry was posted in Book Design, Books, Projects, The Drift and tagged bamboo, broadside, Centaur, Drop Everything, letterpress, literature, poetry, prose poem, Schwaner, St Brigid Press, The Drift on February 20, 2014 by Jeff Schwaner. For those who’ve followed the adventures of my old friend Goat over the last few weeks as I’ve posted them, many thanks. On to new stuff! Happy holidays to all. This entry was posted in Books, Poetry and tagged a r ammons, contemporary American poetry, goat, letterpress, literature, poetry, troll on December 23, 2013 by Jeff Schwaner. now. As a rule, I am never home. 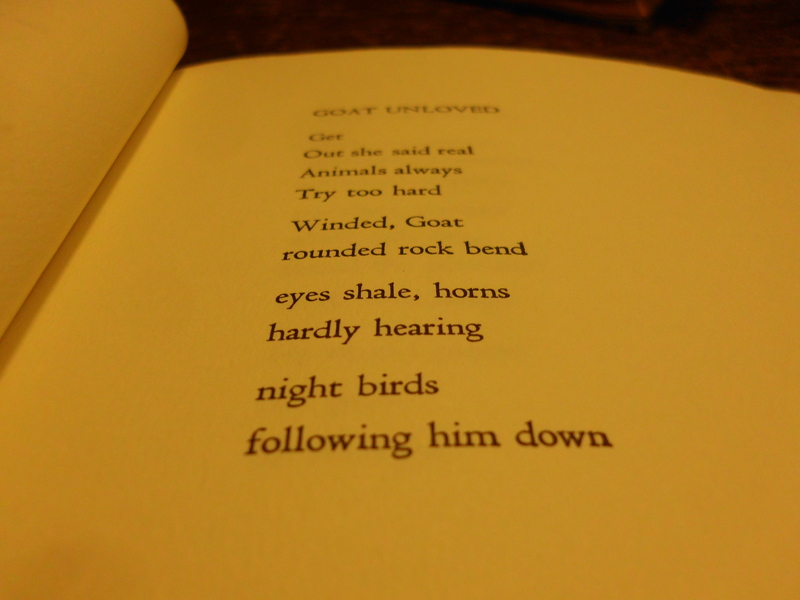 The last poem from the sequence GOAT lies down on Broadway. For more info see here. This entry was posted in Book Design, Books, Poetry and tagged beasts, broadway, contemporary American poetry, Cornell, goat, Ithaca, letterpress, literature, poetry, Schwaner, Tom Williams, troll on December 22, 2013 by Jeff Schwaner. gets out and shoots him. Goat is dead. This entry was posted in Book Design, Books, Poetry and tagged broadway, contemporary American poetry, Cornell, goat, Ithaca, letterpress, literature, poetry, Schwaner, Tom Williams, troll on December 22, 2013 by Jeff Schwaner. tape. The sky stops falling. It’s only chicken blood, says Troll. 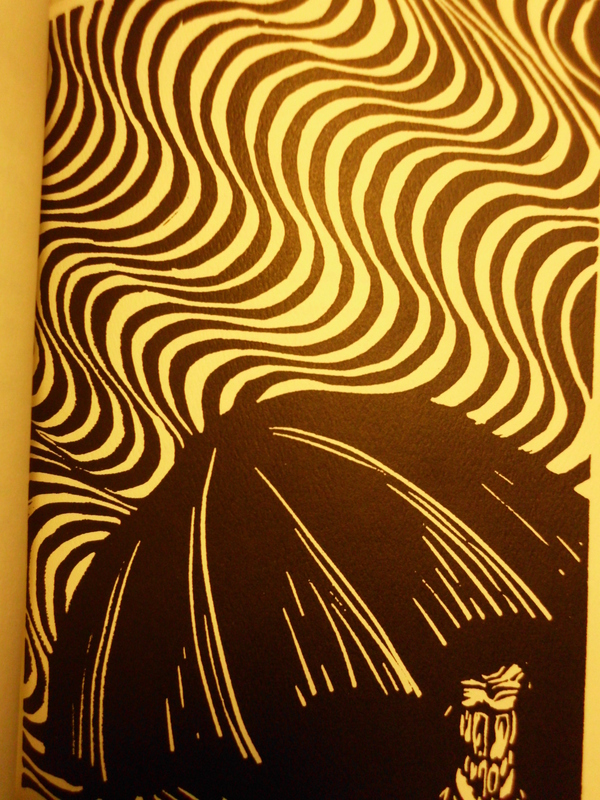 Lino-block art by Tom Williams. This entry was posted in Book Design, Books, Poetry and tagged chicken little, contemporary American poetry, Cornell, goat, Ithaca, letterpress, literature, New York Post, poetry, Schwaner, sky fall, Tom Williams, troll on December 21, 2013 by Jeff Schwaner. he read it in the Post. by force of sheer ugliness. All over, people carry umbrellas. They think it is only raining. a subway entrance, catch a train. This entry was posted in Book Design, Books, Poetry and tagged contemporary American poetry, Cornell, goat, Ithaca, letterpress, literature, New York Post, poetry, Schwaner, sky fall, Tom Williams, troll on December 20, 2013 by Jeff Schwaner.